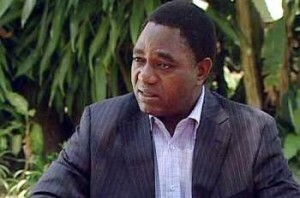 Scores of bus drivers last evening stormed the UPND secretariat along Addis Abbaba road demanding to be addressed by UPND president Hakainde Hichilema over the 21% fuel price increases. The bus drivers who were chanting anti-PF slogans arrived at the UPND secretariat around 17:30 hours at the and threatened to take the law in their own hands as they felt cheated by the PF promises. The drivers who chanted ba Sata balitigo’nga (Sata cheated us) demanded to be addressed by Mr. Hakainde on the next course of action for this country. But the drivers who did not find Mr. Hichilema and other senior party officials as they had already knocked off promised to go back to the secretariat or follow Mr. Hichilema to his house. When reached for a comment, Mr. Hichilema who was away for campaign meetings said he would find time for them as he was aware of the plight of the bus drivers together with the many Zambians that feel let down by their government. “I am not in a position to comment further as I am aware in the bush for some meetings. I will meet my ‘boys’ soon and as a party will issue a more comprehensive statement on this and many other issues, including the pending Zesco electricity tariffs increase which the PF is determined to increase in order to raise money for by-elections,” he said. The PF regime that promised low fuel prices for people to have more money in their pockets last night increased the pump prices by 21 percent after removing the five percent levy, a situation that will negatively affect people’s incomes such as the minimum wage. The same night the PF government was increasing the fuel prices, the South African government was reducing the fuel prices because of the reduction on the world market. Zesco has also been wasting people’s time and money by holding meetings on the pending electricity tariffs increase when they have already made up their mind. Zesco MD Cyprian Chitundu yesterday black-mailed participants at the hearing that Zambians have no choice but accept the increase in order to avoid load-shedding. The company is also the biggest beneficiary of the Eurobond loan that will be paid by tax-payers. President Michael Sata currently runs the biggest cabinet in Africa that is supported from tax-payers money. The nation has also seen an unprecedented levels of by-elections created by the PF bribing some opposition MPs, with the lastest being Feira where Patrick Ngoma sold himself.